Black, which has no problem dumping cards into its GY and has easy access to Urborg, got hosed? What ability does filth give? It's a decently strong effect, especially in RW where you have looting/rummaging effects to get it into the yard. Instant speed, reuasable protection for all your creatures is a rare effect, and it's pretty aggressively costed once Glory is in your yard. Not a card to just drop into any deck, but still one with a good number of homes. And as a bonus, the promo is extremely nice. I like this card, but I have never really found a good, lasting home for it in one of my decks. It was in Alesha for a year or more, and that was probably the best fit I've found so far, but eventually it was replaced by Recruiter of the Guard, which plays a more valuable role as a reusable toolbox tutor. Maybe if I ever build a Karador deck. Swampwalk. All your critters are unblockable! An enduring fave from The New Testament: The Set Judgment. The prerelease version of this card in my uncle's binder was one of the cards that fascinated me a lot when I started playing MtG with 13. This card is really powerful, and I overlook it too often. The trick, of course, is getting it into the yard in a white deck. But the payoff is so big! Late game it can usually read 2W: your creatures are unblockable until end of turn. I haven't used it in EDH much, but I might dig up a copy of it and throw it into a deck and see what I think! Used to be a staple for me in most all W/x lists since at the Dawn of My Time in EDH (so around Lorwyn-Alara era) a 3/3 flyer for five mana wasn't totally unacceptable stat-wise and the ability was potentially game-ending. Since then it's fallen off a lot - creatures and protection abilities have gotten much, much better. Graveyards have also gotten increasingly powerful, which has taken graveyard hate from "nice to have" to "almost as essential as running removal". I think I own 3 including my prerelease copy, but play it nowhere - it didn't even get play in my Darien deck where it likely would have been amazing. Can we take a moment to appreciate how hosed Black got in that cycle with Filth. Black, Blue, and Green all get evasion abilities from the cycle. Your opponent can counteract the flying from Wonder by playing their own fliers or creatures with reach (or effects like Chaosphere or Gravity Sphere). Your opponent can counteract the trample from Brawn by playing bigger blockers. Your opponent can only really counteract the swampwalk from Filth by playing a completely different deck (or making themselves super vulnerable to nonbasic hate), and since Planar Chaos maybe not even then thanks to Urborg, Tomb of Yawgmoth. He should've Geddon'd. All's fair when its being played against you anyway. I've always really liked Glory. I was actually hoping this cycle would get a reprint in UMA. We got Anger but nothing else which is a bit of a bummer. Glory is not a part of that cycle. Valor is the white member of that group. Also Brawn is in UMA. That said Glory can be game ending or a total blank. Maybe I should get one for my Trostani deck. Would probably be the former in there. I didn't even know Valor existed. And yeah my bad, I hadn't noticed Brawn in UMA. I was hoping for Genesis too, tbh. All this; White is the hosed one of the cycle. First Strike is a bit underrataed, so Valor isn't terrible, but it isn't an ability that suddenly sets up lethal attacks your opponent has to play around the same way Anger, Wonder, Filth, and Brawn do. Let's be real though, Filth sucked when it came out, and that's why it still has that reputation. It's the worst of the cycle in a vacuum by a decent margin. Urborg single handedly made it's stock rise, and that's actually relevant in commander, making it second only to anger in the cycle for commander (because haste is really good). But for a few years it was a legitimately bad card, then for a few more years it was a card with a cute interaction with a rare land in casual. In commander it's a hidden gem, but only if you are already planning on getting urborg out. I know you all have opinions on this one, no holding back. They all laughed when I ran him in Animar. Then I Deepglow Skated. Who's laughing now? He trash but he fly. We need a new Tibalt. I actually ran him in a Nekusar, The Mindrazer deck when I first started getting “competitive” in the EDH scene(when I first started playing, I literally only played with cards I liked, regardless of power level, like running Stab Wound in my Sygg, River cutthroat deck, cuz neat synergy bro.) I fondly remember blasting off a Prosperity for 10, killing most of the table, and finishing off the last 17 points of damage by firing off Tibbys -4. I drew, but didn’t discard, Prosperity off of his +1 to get him to 5 loyalty. Yes and what Color does Swampwalk affect the most? So Black got an incarnation that specifically targets itself as opposed to the other 4 that got far more wide spread keywords. Eh, Swampwalk is basically unblockble when relevant(which, if it isn’t relevant, why are you running it? ), which is far superior to any of the other incarnations, even Anger. I’ve had far more success running Filth than the others, and I’ve actually cut cards to make room for it, whereas the others usually are part of first cuts/final revisions. Glory is cool, but that activation cost is a real stinker. 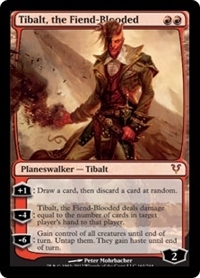 I'd like to see another iteration of Tibalt. This iteration stinks, but he's pretty cool regardless. I would assume still them, minus the dude with 15 cards? And who does it hurt the most when it is relevant, Black got..a super powered card against..black, and I run the other 4 depending on what the deck is. I never Run Filth though, the only way for it to be consistent is if you run Urborg, and I dislike a two card combo for evasion unless I am playing like Phage. My main point is that I find it hilarious that the other 4 give general and large keywords, meanwhile Black gets something that is only useful against black itself as opposed to Fear or something. As for Tibalt...poor Tibalt, the guy should..have gotten a new form in the Lord Windgrace deck, Hilariously I talked someone into Running him as a one of sideboard card in his Modern Hollow One deck to bring in against U/W control, He said he only got it down once..but it apparently got to dome the opponent twice. I imagine they're implying they managed to actually insurrection with him, although it taking a skate to do so. At least it crews Heart of Kiran. He doesn't even do it cheaply best, Pirate Jace, Sarkhan Fireblood both do exactly what Tibalt does with a +1..but without the random discard and cost 3 so they would come down the turn after Heart..